Provides assistance to those who have difficulty stepping over bathtub walls. Anodized aluminum frame is lightweight, durable and rust-resistant. Drainage holes in seat help to minimize water build-up. Side support arm aids in lateral transfer. 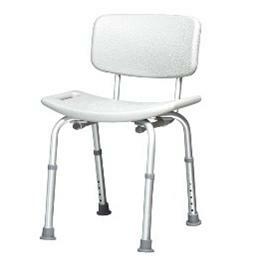 Chair comes in an attractive platinum grey color. Other features: Seat height is adjustable in half-inch increments Reversible back attachment to accommodate any bathroom Maximum weight: 350 lbs Seat width: 29" Seat depth: 20"